Woke up after 6 hours of sleep. Had the cup of green tea that my husband left for me before he went to work. Woke my daughter and got her ready for school. Breakfast: Oatmeal with sunflower seeds, banana and cinnamon. Walked back to school. Our daughter had a school performance. Walked to school to bring my daughter home. 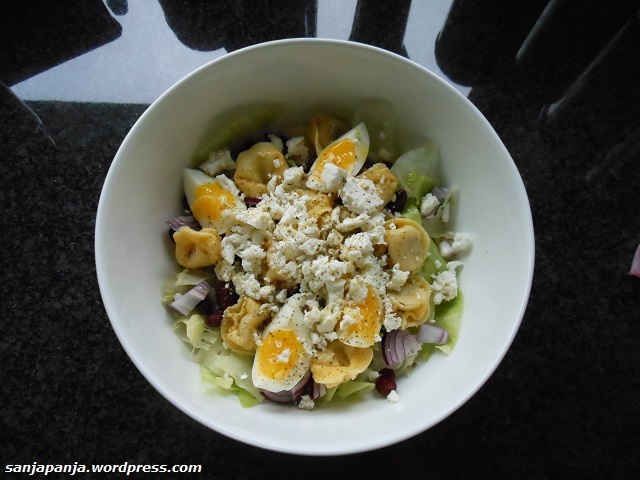 Lunch: Iceberg lettuce, kidney beans, tortellini, boiled eggs, red onions, feta cheese, extra virgin olive oil and vinegar. Walked with my daughter to Fungym. Walked back to Fungym to bring my daughter home. Today it rained almost all day, but there was almost no wind, so we enjoyed our walk with our umbrellas and rubber boots. Dinner: Pasta, Chinese cabbage, smoked chicken breast, creme fraiche, red pesto and Parmesan cheese. This entry was posted in food, life and tagged 6 hours of sleep, apple, banana, beans, boiled eggs, breakfast, cabbage, cheese, chicken, Chinese cabbage, cinnamon, creme fraiche, daughter, dinner, extra virgin olive oil, feta, feta cheese, food journal, fungym, green tea, husband, iceberg lettuce, kidney beans, lunch, no wind, oatmeal, olive oil, onion, parmesan cheese, pasta, pesto, rain, red onion, red pesto, rubber boots, school, school performance, smoked chicken, smoked chicken breast, snack, sunflower seeds, tea, tortellini, umbrella, vinegar, walk, walking, walking to school. Bookmark the permalink. A walk in the rain? Beautiful.